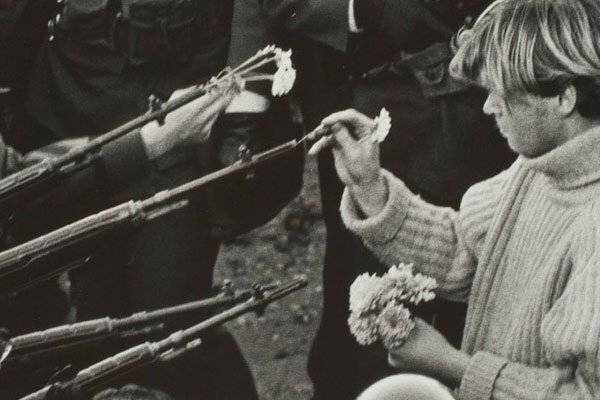 The current exhibition at the Worcester Art Museum, From Kennedy to Kent State, consists of an extensive series of images drawn from the leading photojournalists of the 1960s, all of them more than familiar to persons of a certain age, and most of them familiar (from history books) to younger fry. As the title suggests, the show includes photos connected with the incomplete, violently interrupted presidency of John F. Kennedy and photos taken in Vietnam during the increasing American involvement in the war and the growing anti-war activities at home. But it also includes some happier images—mostly those connected with the rise of popular musical artists of the day (some rock and folk musicians, the Beatles, and some whose lives were cut short by drugs), visual artists introducing minimalism and other popular trends of the day, the worlds of fashion and celebrity, and the triumph of the moon landing just at the end of the decade. But for the most part the mood of the exhibition is set by images of three assassinations (the Kennedys and Martin Luther King), the darkness and the courage of the struggles for civil rights for African Americans especially, and the increasing violence both in Vietnam and at home as the war and protests against it increased. The ‘60s saw a flourishing of folk music (Joan Baez, Bob Dylan, the Kingston Trio, and others), who increasingly emphasized songs of protest as the war in Vietnam dragged on. And it marked the British Invasion of rock and the rise of new American rock artists, some of them still performing today, others whose careers came to sudden, drug-fueled ends in the decade that saw their flowering. Many of the photographs in the exhibition evoke the glories and sorrows of that era. But one important aspect of American music of that period has been largely overlooked: the concert music in the classical tradition, which was also created by a large number of gifted composers, mostly using some version of the modernist language developed by Schoenberg and his followers earlier in the century. Such music never attracted the large audiences that the popular artists did, of course. It was not hummable. It rarely had texts that could suggest a manning of the barricades. Yet it was just as much of the period as Dylan, Baez, the Beatles, Joplin, and the others. It was not “pretty” music because those were not pretty times. As a member of that generation, I remember all too well sitting in the dining hall at college fifty years ago, just after President Kennedy announced that Soviet missiles were being delivered to Cuba and that the U.S. government was evaluating possible responses. On that October evening in 1962, we seriously discussed whether any of us were likely to be alive at Christmas. And the two years that followed brought three traumatic assassinations and a sudden increase in the country’s involvement in Vietnam; our “advisers” had turned into a full army, pursuing a war that many thought pointless and wrong-headed and that seemed as if it would never end. Music composed in such times certainly does not evoke the periwigged graciousness of European courts, or even the jazzy swing of New York nightspots. The musical language was intense, largely dissonant in character, with complicated rhythms (virtually no toe-tapping), calling for players of great technical accomplishment to offer even a minimally effective performance. Scott Parkman, the founder and artistic director of American Century Music, assembled a first rate string quartet to perform four significant and varied works by major composers composed in the heart of the ‘60s, bringing back the dark thoughts of those days as caught in the works of leading composers. The quartet consisted of three well-established old hands in Boston music-making: violinists Gabriela Diaz and Katherine Winterstein and cellist David Russell; to them was added an increasingly active young violist, Wenting Kang, still a master’s candidate at the New England Conservatory. Their playing in the two string quartet pieces was dynamic, taut, and powerfully expressive. Each half of the program began with a work for an unaccompanied stringed instrument with which Russell and Diaz made a strong effect. Roger Sessions’s Six Pieces for Violoncello (1966) are brief but intensely dramatic, alternating faster movements that may be heard as expressively tormented with slower ones that are more tranquil but hardly “sweet” (the central Berceuse, or “lullaby,” is naturally the most relaxed of the set). The entire series covers the cello’s wide range in pitch and demands the control of dynamics from full throttle to the merest whisper. David Russell was electrifying in meeting these demands. The solo work in the second half was Steve Reich’s Violin Phase (1967) for solo violin with a prerecorded version of the music played back digitally (it could alternatively be played by four violins live). This piece adumbrated a significant change in American music at just about that time: the development of a new simplicity in harmony, especially, as a response to the intensity of non-tonal music just after the midcentury. This new style, which came to be known as “minimalism,” began in the visual arts with works often based on small images repeated over and over in a large-scale pattern. This early Reich piece similarly plays with a tiny figure running just seven beats with four different pitches, which is played over and over and over from beginning to end. Gabriela Diaz was the solo player who gave it the fierce concentration required to perform just slightly faster than same part in an electronic recording. Her principal line gradually moves ahead of the other, until eventually it “laps” the prerecorded part like a racer steadily heading to the finish line a full circuit ahead of the other. As the parts diverge, the effect of the ensemble changes kaleidoscopically. Diaz maintained that concentration and the strenuous repetition required from beginning to breathless conclusion. Of the two string quartets offered, David Diamond’s String Quartet No. 7 (1963-64) was the more traditional, employing such classical structural features as theme and variations in the first (of two) complex movements and an elaborate extended fugue in the second. The aggressive opening figure consists of two quarter notes a half-step apart. The first of these, in the first violin, consists of D and E-flat in octaves. When this is echoed by similar semitone figures densely overlapping in the other voices, it struck these ears as a possible reference to Shostakovich’s musical motto, DSCH (D, E-flat, C, B-natural in German notation), or possible an inversion of Bach’s BACH (B-flat, A, C, B-natural). The second half of either motto is not literal, but those mottoes are so familiar in many circles, and the quartet makes such frequent reference to it throughout both movements, that it is hard not to think of it in part as an homage. The thirteen variations that form the heart of the first movement are marvelously varied, with strong divergence between, say, Variation 9 (all pizzicatos and staccatos) and Variation 10 (heavy, sustained four-part counterpoint in marcato). The lengthy central part of the second movement is a dense fugue (it is not clear to me why Diamond labels it “Fuga seconda,” since there is not formal first fugue in the piece). With all its frequent change of color and texture, the quartet is a massive, driven score, which the players projected with tremendous energy. The program closed with Leon Kirchner’s Quartet No. 3 for Strings and Electronic Tape (1966), which received the composer’s Pulitzer Prize for music. Electronic music appears but rarely in Kirchner’s music, though the period of the 1960s was a time when many composers experimented with its possibilities. The challenge in combining live performers with an electronically created part on tape, especially for a composer of Kirchner’s rhapsodically expressive music, is that live players always differ from one performance to the next, while the tape never changes in tempo, interrelationship of the parts or otherwise (barring a technical failure). It was this issue that Kirchner (and others at the time) found quite absorbing. The other difficulty of the early 1960s was that the technology of creating the electronic sounds was still pretty much in its infancy. A half century later computers offer far more flexibility and ease of creation. Anyone listening to the electronic part of the score will find it hard not to think of the “bleeps” and “bloops” of science fiction films. Yet Kirchner’s quartet, cast as a single movement with “solo” and “ensemble” passages and an extended electronic coda at the end, is by no means as silly piece, as the passage of time might have made it seem. Much of the electronic part is rhythmic (starting with simple clicks, then bongo-like sounds), but it gradually becomes more varied and central. The presence of the sound technician (James Borchert) is crucial here. Again the string quartet entered beautifully into the spirit of the piece, capturing the sustained opening hush from which the tape first emerges as a self-sufficient part, and driving the full energy of the climactic passages. A work like this is best heard in live performance in order to allow each of the parts to make its fullest effect, and the performance at the Worcester Art Museum was a splendid conclusion to the program. Steven Ledbetter is a free-lance writer and lecturer on music. He got his BA from Pomona College and PhD from NYU in Musicology. He taught at Dartmouth College in the 1970s, then became program annotator at the Boston Symphony Orchestra from 1979 to 1999.